To go and on the road. Blue Apron, the boxed meal delivery company, recently announced their “Blue Apron Unboxed” initiative, celebrating home cooking with a series of pop-ups that launched at the end of May in New York City. Now, the brand is hitting the road with a three-city tour that begins tomorrow (July 14) in Los Angeles and continues the following weekends in Seattle and San Francisco. The centerpiece for “Blue Apron on Wheels” is a 40-foot long Blue Apron box designed for discovery in an immersive, multi-sensory activation. Patrons can venture through four colorful interactive rooms where they can find specialty snacks, pose for photos, and enjoy exclusive giveaways or chances to win prizes. Blue Apron brand ambassadors will be on hand to share its sourcing philosophy, including its commitment to using non-GMO ingredients, a newly-released animal welfare policy and the sourcing of sustainable seafood. 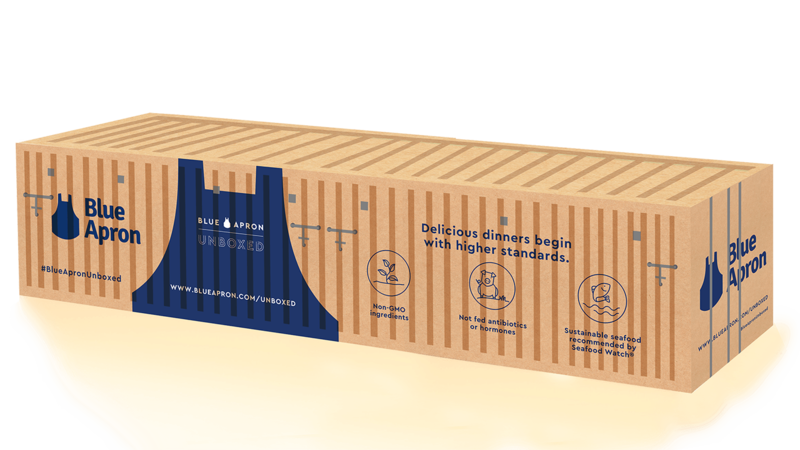 In addition to the 40-foot long container, Blue Apron will have two tents on-site where consumers can browse Blue Apron wines and merchandise, learn more about the brand and how to purchase online. All are encouraged to share their experience on their social channels using the #BlueApronUnboxed hashtag. The tour ends July 29 in San Francisco.